One of the biggest decisions car buyers make is the size of their vehicle. Whether dealing with sedans, SUVs, or even pick-up trucks, getting the right class of vehicle is crucial to being satisfied with your vehicle purchase. For certified pre-owned Acura buyers, the mid-size MDX SUV and compact RDX SUV are two of the best-selling and most cross-shopped vehicles at Acura dealers. We’ll be examining the core differences between a used MDX vs. used RDX in order to help you figure out which is best for your individual situation. This includes exterior size and design, interior spacing and features, pricing, and driving experience. Let’s get the elephant in the room out of the way first! Because we know it’s one of your primary concerns, even when buying from a high-end brand like Acura. While pricing for used Acura vehicles will always depend on the equipment featured in each specific model, you will find that a one-year-old MDX will cost around $8,000 more than a similarly equipped RDX with the same mileage. A one-year-old certified RDX with less than $10,000 miles will likely range anywhere from $32,000 – $36,000. The same MDX could range from $40,000 to $46,000. On the outside, the MDX and the RDX offer some major visual differences. Sure, they both boast Acura’s distinctive grille and a window line that tapers off toward the rear, but these two crossovers are quite obviously different in size, with the MDX appearing both wider and longer than its RDX cousin. And that apparent visual difference isn’t just a trick of the design: The MDX stands around 193.6 inches long, compared to 184.4 inches for the RDX. In short, these two SUVs have similar styling but major differences in dimensions. The MDX and RDX are more similar on the inside than they are on the outside, especially in front, as the two models share switchgear, dashboard designs, steering wheels, gauges, dual-screen infotainment setups and general interior designs. But there are still a few notable differences. Unlike the RDX, the MDX offers a sleek new push-button gear selector in place of the traditional lever. The MDX also offers more interior room and — perhaps most importantly — a standard third-row seat. That feature alone will send some drivers straight to the MDX, as you can’t get a third row in the RDX. The MDX and RDX are surprisingly similar in terms of features and technology, though there are a few features that set apart the two SUVs. For instance, only the MDX offers a rear-seat DVD entertainment system. It’s not available in the RDX, which is less likely to be hauling around kids. And only the MDX offers fuel-saving start/stop technology, heated rear seats and rear-window sunshades. But both the MDX and the RDX share most of the big stuff — a dual-screen infotainment system, an available navigation system and a wide range of modern safety gadgets, including lane-departure warning, forward-collision mitigation with automatic braking, a blind spot monitoring system and more. As a result, we think technophiles will be happy with either model, though we think the MDX’s advantages over the RDX mainly benefit parents with kids. On the road, the RDX and the MDX offer surprisingly similar driving experiences. By that we mean both models are comfortable, quiet and easy to drive, with strong visibility and a commanding view of the road. Both models also offer a strong, responsive engine that gives off a reassuring roar but doesn’t intrude into the cabin. Although this is where Acura would probably like us to say the RDX is a little more engaging to drive than the MDX, we don’t really think that’s true. Yes, it’s smaller and a bit quicker, but it’s still hardly a class leader in terms of driving dynamics. Instead, think of these two SUVs as exactly what they are: luxurious, smooth and comfortable but hardly daring or especially engaging to drive. 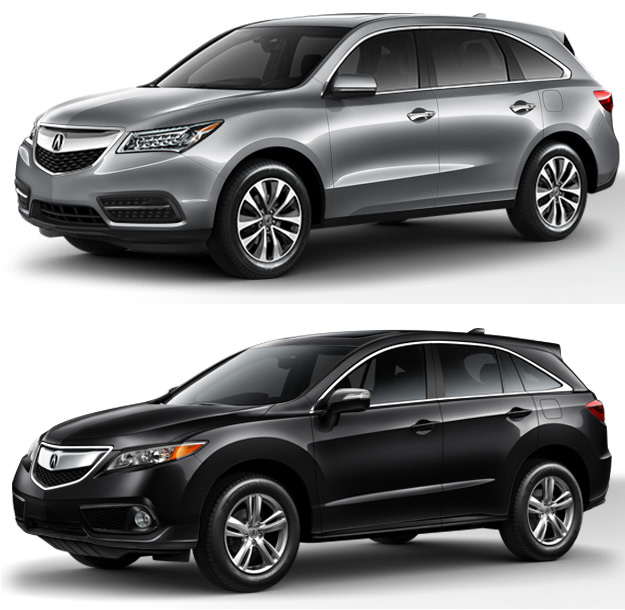 When it comes to features, styling, and technology, the MDX and RDX are extremely similar. The big differences come down to size and driving dynamics. If you’re okay with giving up space, the RDX will provide a little more excitement during everyday driving, but if your primary purpose for this SUV purchase is family, you may lean toward the MDX. With third-row seating and extra cargo space, it only takes a couple of events to make you wish you sprung for the larger of the two. Want to Learn More About the Certified Pre-Owned RDX? Click Here! Want to Learn How Acura’s Certified Warranty Compares to Others? Click Here!